Today, the Church celebrates the 100th anniversary of the first apparition of the Virgin Mary at Fatima in Portugal, and the canonization of two of the three young children who received the visions, Jacinta and Francisco Marto. Of course, many recent articles about these events have noted that it was also on this day in 1981 that Pope St John Paul II was shot in St Peter’s Square, while moving though the crowds at the weekly papal audience. His Holiness always ascribed the preservation of his life to the direct intervention of Our Lady of Fatima; as a sign of gratitude for his deliverance, the bullet which just missed his heart is now mounted in the crown of the famous statue. 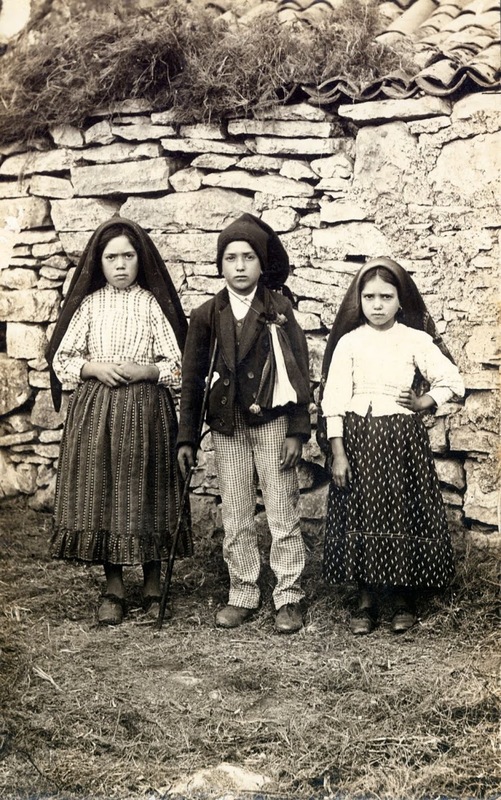 The well-known photograph of Francisco and Jacinta Martos (middle and right), who as of today are the Catholic Church’s newest Saints, together with their cousin Lúcia Santos, whose cause for canonization is in process. St Francisco died on April 9, 1919, at the age of 10, St Jacinta the following year on February 20, at the age of 9; both were victims of the great influenza pandemic which raged though the years 1918-20, one of the greatest natural catastrophes in human history. (More deaths were caused by the so-called Spanish flu in those years than were caused by the First World War.) Sister Lúcia died on February 13, 2005, at the age of 97, almost 56 years after her profession as a Discalced Carmelite. There are a few other important Marian events connected with this day which have received rather less attention. One of these is the consecration of the Pantheon in Rome as a church in honor of the Virgin Mary and All Martyrs, which took place in the year 609. As I have noted on more than one occasion, the name “Pantheon” means “building of all the gods”, but there is no evidence that there was any kind of collective worship of all the gods in the ancient Roman world, and no evidence that the building was a temple. The idea is probably a misunderstanding which arose in the Carolingian period, when much of ancient Rome lay in ruins; to an early medieval Christian’s eyes, the imposing mass of the building, dominating the center of the city, could hardly have appeared as anything other than a religious building. Nevertheless, the legend persists that the building was dedicated to All Martyrs, and hence to All Saints, because it had previously been a temple of all the gods; it remains in the traditional Martyrology to this day. Solemn Mass in the traditional rite celebrated in the Pantheon on May 13, 2009, the 14th centenary of its dedication as a church. Another legend connected with the Pantheon is that of a blind cantor who composed the responsory for the Annunciation, “Rejoice, o Virgin Mary, you alone have destroyed all heresies, who believed the words of the Archangel Gabriel: while Thou begot both God and man, and after His birth, remained a Virgin inviolate.” The first part of this is also sung as the 7th antiphon of Matins on feasts of the Virgin. In the year 1792, the same day saw the birth of Bl. 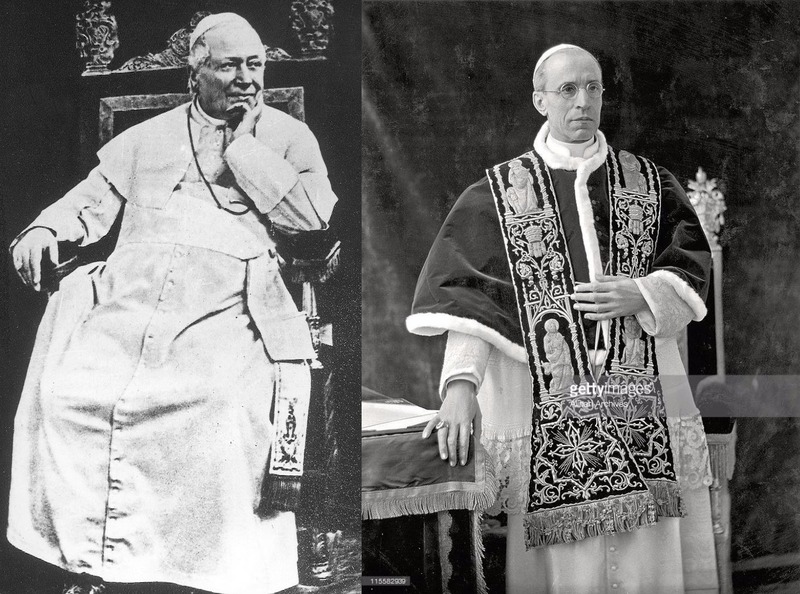 Pius IX, the Pope who would later formally define the dogma of the Immaculate Conception. As a young man, he had suffered from some kind of seizure disorder (it does not appear to be absolutely clear which one), of which he was cured at the most important Marian shrine in Italy, that of Loreto. Even more remarkable is the fact that Eugenio Pacelli, who as Pope Pius XII would formally define the dogma of the Assumption in 1950, was being ordained a bishop in the Sistine Chapel on May 13, 1917, at the very same time that the first apparition of the Virgin was taking place at Fatima.